Both types of controller have their place, says Sony's research and development head. Motion controls might be rather popular at the moment, but the head of R&D for SCE America, Dr. Richard Marks, doesn't think that the regular controller is going anywhere just yet. Marks was one of the principle designers behind Sony's Move controller, and was the originator of the EyeToy. 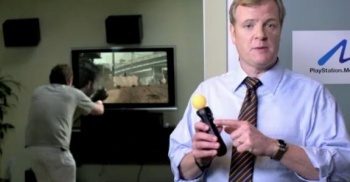 Marks said that Sony's goal had never been to replace control pads with the PlayStation Move. Instead, the idea was to give people more ways to play, and bring gaming to those who might find a traditional controller "intimidating." He said the gamepad a good "abstract" device that developers could use for a wide range of gameplay experiences. He added that it didn't make any sense for Sony to ditch controllers in favor of motion controls, because it could do things that a motion controller couldn't, and vice versa. Unlike some other Sony designers, he also had positive things to say about Kinect. While he made it clear that he thought that the device only allowed for a fairly narrow range of experiences, he praised Microsoft for continuing to innovate on camera technology. He also said that he was pleasantly surprised by the microphone on Kinect, and while it was still a little stiff, it worked a lot better than he was expecting. While Marks isn't confirming that the PS4 will have regular controllers, he's right when he says that dumping them for motion controls doesn't make any sense. There are literally millions of core gamers who like controllers just fine, and it's hard to see Sony snubbing that audience. What's much more likely is that it will try to grow both the core and casual audience side by side with some deft marketing, and a console that can offer as wide a range of experiences as possible.